Looking for answers? Below is an FAQ that will hopefully answer most of your questions. Work Method Statements: Am I required to have them to be compliant? Although there is no specific requirement for a document called a ‘Work Method Statement’ (or ‘Safe Work Method Statement’ as it is known in Australia), S36 (3)(c)(f) of the NZ Health and Safety at Work Act 2015 places a duty on the person conducting the business to ensure the provision and maintenance of safe systems of work and, to provide any information, training or instruction necessary to protect all persons from risks to their health and safety. A Work Method Statement is a way to provide this information, training or instruction to workers. Work Method Statements have become such a common and valuable tool that many businesses in New Zealand use them as part of their safety systems, even though they are not legislated for use by New Zealand. In fact many Principal Contractors (PC), local government bodies and other parties accepting tenders for contracts, request Work Method Statements to be included in a contractor’s safety systems. This demonstrates to the PC that the contractors have received the appropriate health and safety training and instruction to carry out their job prior to arriving onsite. What information should a Work Method Statement contain? Describes how the control measures will be implemented, monitored and reviewed. It is important that the information included in WMS is clearly set out, be easily accessible and fully understood by all site supervisors and workers. 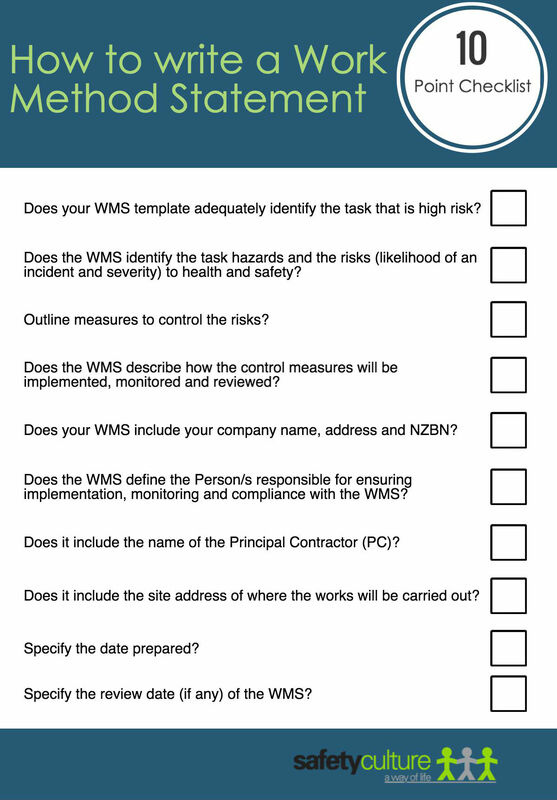 The content of a WMS should provide adequate directions on how the risk controls will be implemented. What is a Workplace Health & Safety Management System? A Health and Safety at Work Management System provides a practical guide for employers to manage occupational health and safety in their workplace. Full of essential policies and procedures to guide the actions and behaviours of all employees, a management system assists business operators in providing a safe and compliant workplace. Am I required to have a Workplace Health & Safety Management System? As a Person Conducting a business or undertaking (PCBU) you are responsible for ensuring, so far as is reasonably practicable, that you provide and maintain a “safe systems of work” (eg work processes). This means you need a method of communicating these processes and implementing them into your business. The basis for this process begins with a Health and Safety at Work Management System (HSWMS). Policies are a set of mission statements that clarify how a business intends to address workplace health and safety issues. They guide and influence decisions to reach a desired outcome. Why is it necessary to keep OHS records? Essentially OHS records help your business document when a certain action has taken place. For example, say an injury has occurred on site, your business has a responsibility to ensure the event has been recorded, in this case, an Event / Injury form should be completed. What is a Safe Operating Procedure? Workplaces generally place Safe Operating Procedures on or near pieces of equipment or near areas where works are to carried out, so that workers can easily access them. Is my business obligated to have Safe Operating Procedures? Although business are not legally required to have Safe Operating procedures, the NZ Health and Safety at Work Act 2015 places a duty on the person conducting the business to ensure the provision and maintenance of safe systems of work and, to provide any information, training or instruction necessary to protect all persons from risks to their health and safety. A Safe Operating Procedure provides a way to deliver this training, information and instruction in a simple and easy to follow document. How long will it take to receive my documents? Your purchased products will be emailed to you directly upon receipt of payment from our online store and normally takes no more than 30 minutes. For payments made via bank deposit, documents will be provided upon receipt of payment or upon the confirmation of payment from the SafetyCulture Account Department (Note: This can take up to 2 days). Should you have any issues receiving your documents our Customer Service Team is here to assist and can be reached on 1300 306 604 during business hours. How do I download my purchased products? All our documents are emailed upon receipt of payment, in Microsoft Word format (MS Word), ready for you to download, save and edit as required. Note: You will need Microsoft Word installed on your computer to use any SafetyCulture template.